I have waxed eloquent here, before, about roasting; How, it is just simply transformational, sometimes just elevating a simple dish and sometimes metamorphosing an ingredient completely. I first tasted this magic of the oven when I roasted a chicken. I had tried every form of cooking the bird but roasting was simple the one way, I actually like the meat; succulent, moist and flavorful. Then I roasted veggies. And, that was indeed a revelation! The natural flavors of the vegetables get so enhanced in this process that it isn't just a side anymore. They actually compete with the main dish itself! With Fall comes vegetables, both above and below the ground, that are just perfect for roasting - potatoes, yams, winter squashes, pumpkins, beets, yes, beets. These are starchier veggies and the roasting process brings out their natural sugar and enhances their flavor. You don't need much more than a bit of salt, oil and pepper and you have a delicious vegetable meal! But, the beets; They trumped me! 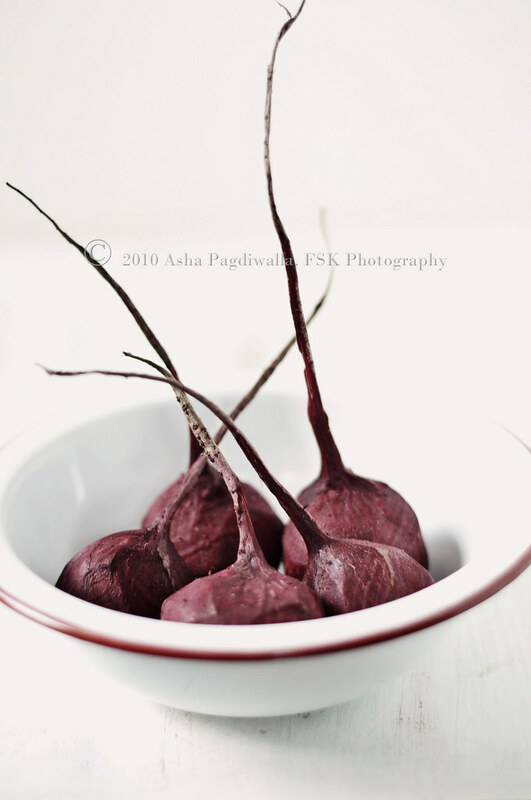 I have detested beets since I was a wee little one. I don't like their color (they look like they are bleeding!) or their taste, which to me just isn't there. Then, one day I roasted them, to make this lovely Spring salad with fresh strawberries.. Here came the evidence of transformation. I was amazed at how good these roots that heretofore I could not palate suddenly became something I could nosh on! Beets being naturally steeped in sugar just bloomed in the roasting process. They were sweet and crunchy and they turn from blood red to a deep auburn which is so much more welcoming!! I would never eat a sauteed or boiled beet but a roasted one? Bring it on! 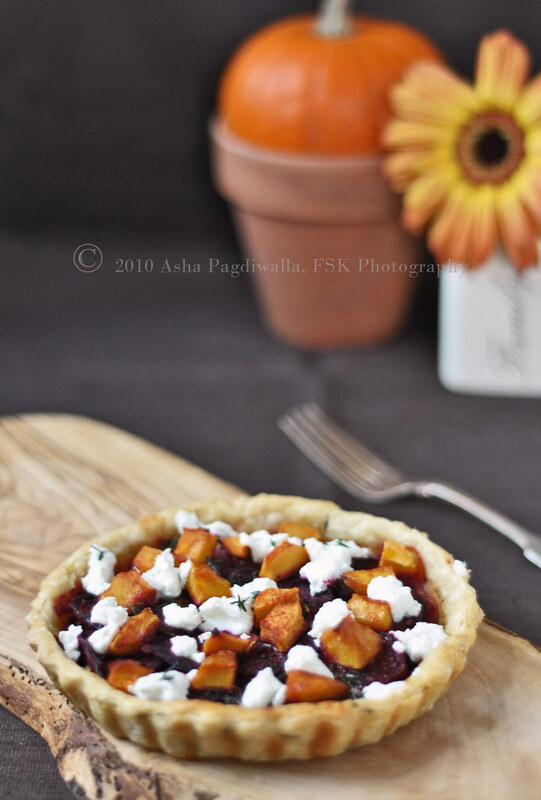 So, inspired by yet another CSA basket, I made this lovely Beets and Squash Thyme Tart with Goat's Milk Ricotta. Goat's ricotta is cheese with an attitude. Goat milk has a different flavor from cow's that some love or don't. Typical goat cheese intensifies that flavor and is also a bit heavy. But, fresh cheese is just perfect; light and mild with a hint of that goat-y flavor but not in the least overpowering! And, a beautiful pairing with beets and squash! Roll out the tart crust into the pan. Mix the two mustards together and spread a thin layer at the bottom of the tart. 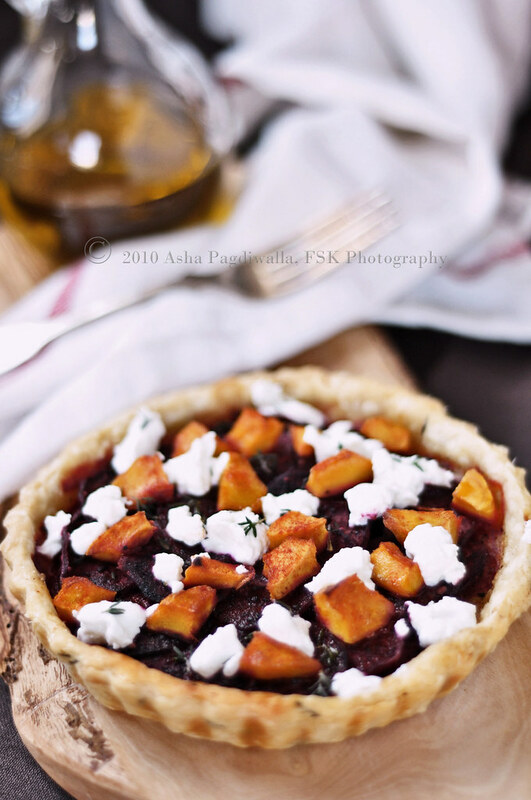 Arrange the beet slices over lapping each other around the tart. Sprinkle a bit of salt, pepper, thyme and a touch of oil. Repeat to make another layer. I only made 2 layers but you can make more if you like. Spread some of the squash on top of the beets. Sprinkle more salt, pepper, thyme and paprika (if using). Drizzle honey over and dot with with olive oil. Bake the tarts at 375 F for 30-35 minutes until the crust is golden brown. The veggies will be cooked by then. 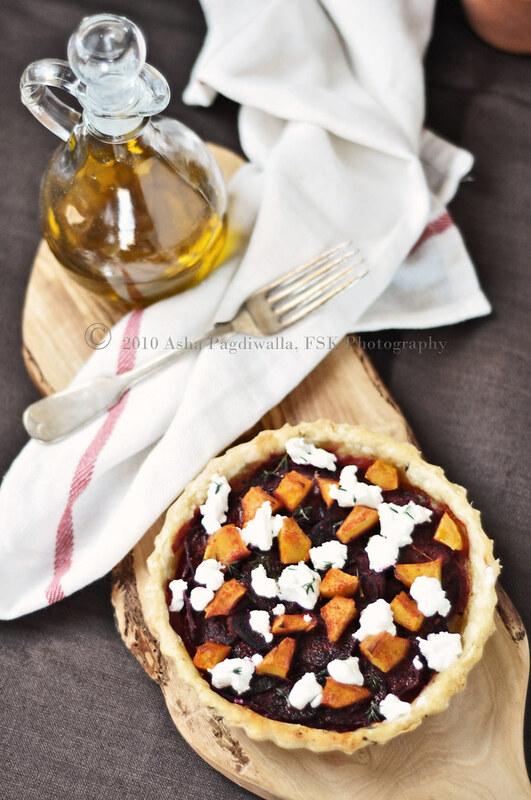 As soon as you remove the tarts from the oven, drop pieces of goat cheese around the tart. They'll start to just melt and will be perfect by the time the tarts are ready to be served. Sprinkle a bit of fresh thyme if you'd like and serve.